This year I’m hanging out the shingle. Really. 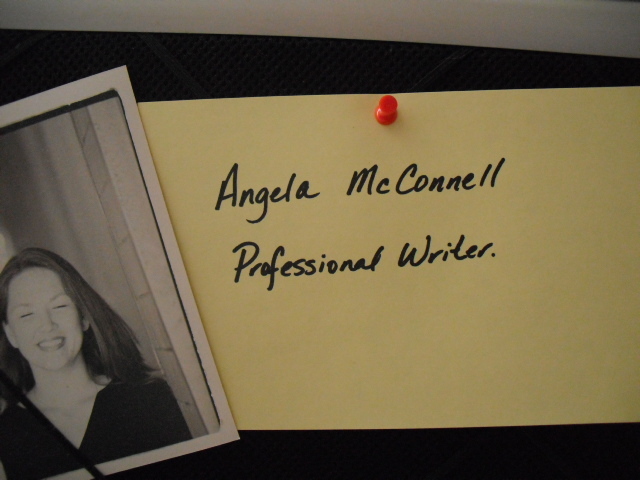 I know I’ve said it before, but this is the first year I file a tax return that lists my occupation as “Professional Writer.” There it is, thumb-tacked to my vision board: “Angela McConnell, Professional Writer.” I am open for business. How do I know this is my year? Because I am ready to put in the work. I am putting in the work. As Steven Pressfield puts it, I’m going Pro. In the past few months, I have experienced the most significant improvement in my writing in every aspect: quality, quantity, consistency, and control. I feel on top of my game, and I feel like it has everything to do with simply getting the work done every day. So why did I – hell, why do we all put our dreams on hold, trying to secure a perfect place in the future for which conditions will be convenient for us to finally hatch our Big Plans? What the hell’s wrong with today? Today looks good. Today it is. I think we do it because the dream is so dear to us that we hold it back, sort of saving the best for last. “Let me deal with all this crap first,” we tell ourselves, “then I’ll sit down and write.” The thing is, there’s always going to be crap. We never run out of crap. Crap is the stuff of life. So why put the crap before our dreams? So I have a plan. I think it’s a good plan. It’s a simple plan. I’m giving up my amateur status, and I’m going Pro. So I promise I will do my best to post consistent, frequent, interesting, helpful, honest, and funny posts on my journey to becoming a Paid Professional Writer, and in exchange, I hope you will tune in, maybe even join in, and share your own successes. So…please to enjoy. And Happy New Year! (1) Now you know what not to do, Einstein. (2) At every moment of our lives, someone somewhere thinks that there’s something stupid about what you’re doing or how you look or what you drive. Oh, well. Right?